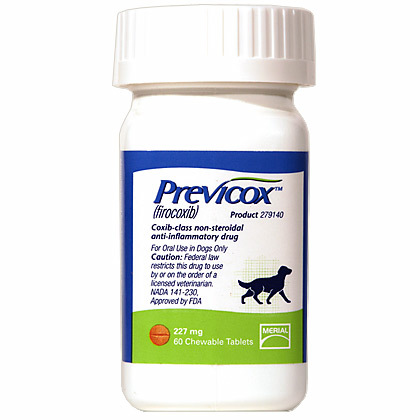 PREVICOX is one of a coxib class of Non-Steroidal Anti-inflammatory Drugs (NSAIDs) and is designed specifically to alleviate the pain and inflammation of osteoarthritis in dogs. PREVICOX is one of a coxib class of Non-Steroidal Anti-inflammatory Drugs (NSAIDs) and is designed specifically to alleviate the pain and inflammation of osteoarthritis in dogs. It comes in a 57 mg and 227 mg size. Possible Side Effects: The most common side effect of NSAIDs is stomach upset, but stomach ulcers may develop, and you may see loss of appetite; vomiting; diarrhea; dark, tarry or, bloody stools; or constipation. Side effects involving the kidney include increased thirst and urination, or changes in the urine color or smell. Side effects involving the liver include jaundice (yellowing of the gums, skin, or eyes). Other side effects may include decreased appetite, pale gums, lethargy, shedding, seizures, incoordination, or behavioral changes. If any of these side effects are observed, stop treatment and contact your veterinarian. If your pet experiences an allergic reaction to the medication, signs may include facial swelling, hives, scratching, sudden onset of diarrhea, vomiting, shock, seizures, pale gums, cold limbs, or coma. If you observe any of these signs, contact your veterinarian immediately. Precautions: Not for use in animals who are hypersensitive (allergic) to firocoxib, carprofen (Rimadyl, Novox), aspirin, etodolac (EtoGesic), deracoxib (Deramaxx), meloxicam (Metacam), tepoxalin (Zubrin), or other NSAIDs. The safety of the drug in breeding, pregnant, or lactating animals (female animals nursing their young) has not been determined. Do not use in dogs less than 7 pounds of body weight. Use with extreme caution and continued monitoring in geriatric animals and those with dehydration or stomach, intestinal, liver, kidney, heart, diabetes mellitus or blood disorders. Do not use in animals with bleeding problems, e.g., von Willebrand's disease. Consult with your veterinarian regarding the importance of weight control in pets with osteoarthritis, and the physical examinations and laboratory testing necessary prior to and during treatment with firocoxib. The use of firocoxib at above the recommended dose in puppies less than 7 months of age has been associated with serious adverse reactions, including death. Drug, Food, and Test Interactions: Consult with your veterinarian before using firocoxib with any other medications, including vitamins and supplements, other NSAIDs (e.g., aspirin, carprofen (Rimadyl, Novox), etodolac (EtoGesic), deracoxib (Deramaxx), tepoxalin (Zubrin), and meloxicam (Metacam); steroids (e.g., prednisone, dexamethasone, triamcinolone, Medrol); enalapril, phenylpropanolamine or methotrexate, since interactions may occur. Use with caution with phenobarbital. The use of firocoxib in conjunction with cardiac, anticonvulsant, and behavioral medications has not been evaluated. Signs of Toxicity/Overdose: May see loss of appetite, vomiting, diarrhea, dark or tarry stools, bloody stools, increased thirst, increased urination, pale gums, jaundice (yellowing of gums, skin, or eyes), lethargy, increased respiration (fast or heavy breathing), incoordination, seizures, or behavioral changes. An overdose or toxicity could be fatal. If you know or suspect your pet has had an overdose, or if you observe any of these signs in your pet, contact your veterinarian immediately. For technical assistance or to report suspected adverse reactions, call the manufacturer at 1-877-217-3543. Keep this and all other medications out of the reach of children and pets. ** This information may not cover all possible uses, directions, side effects, precautions, allergic reactions, drug interactions, or withdrawal times. Always consult your own veterinarian for specific advice concerning the treatment of your pet.